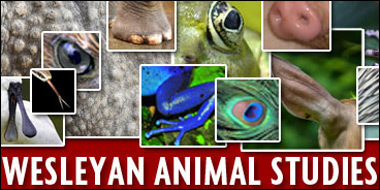 Wesleyan's Animal Studies is hosting the Animals and Society Institute-Wesleyan Animal Studies Fellowship Program Conference June 27-30 in Usdan 108. The event is open to the public. An international group of scholars convenes at Wesleyan on June 27 for a four-day conference on topics in animal studies, including animal naming, the ways children mourn animal deaths, 19th-Century pet-keeping and the human impulse to laugh when playing with dogs. The conference is the culminating event in the first annual Animals and Society Institute-Wesleyan Animal Studies Fellowship Program, which brings to campus a broad range of scholars studying human-animal relations. The group includes professors and Ph.D. candidates in a variety of fields, including psychology, sociology, philosophy, English, women’s studies, veterinary medicine and environmental studies. Eight of the presenters are fellows, the others are invited guests. “We have been extremely impressed with the diversity and high quality of the projects that the fellows are working on,” says Professor and Chair of Philosophy Lori Gruen, a co-host of the program, along with Kari Weil, University Professor of Letters. For a full schedule of lectures and their titles, please click here. The conference runs from Monday, June 27 through Thursday June 30. It is free and open to the public. Events take place in Room 108 of the Usdan University Center. Wesleyan Animal Studies fosters disciplinary and interdisciplinary scholarship on human-animal relations. The fellows have offices at the College of the Environment. Based in Ann Arbor, Mich., the Animals and Society Institute is a nonprofit, independent research and educational organization that advances the status of animals in public policy, and promotes the study of human-animal relationships.